Find out which Reputation level colour you are (and hopefully it’s green)! 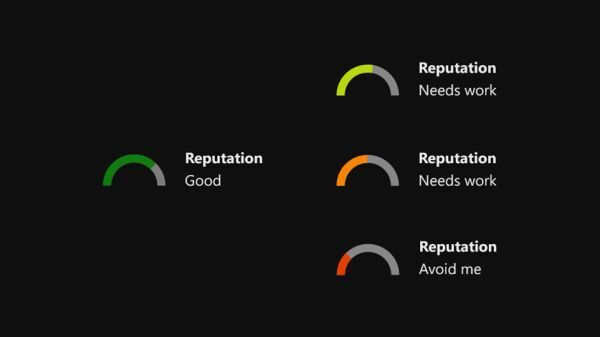 After revealing a new Reputation System for Xbox Live on the Xbox One, Microsoft has finally revealed just how it will work. Program manager on Xbox Live Micheal Dunn stated that, “By looking at someone’s Gamercard you’re able to quickly see their reputation. The more hours you play fairly online without being reported as abusive by other players, the better your reputation will be. “The algorithm looks to identify players that are repeatedly disruptive across the community on Xbox Live. The vast majority of players do not regularly receive feedback from other players and, thus, will stay at the “Good Player” reputation level. Player Reputation is divided into three levels: Green for “Good Player”, Yellow for “Needs Work” and Red for “Avoid Me”. As of now, most gamers fall into the Green zone and Microsoft will be rewarding said players for good behaviour. Those who are in the Yellow will receive warnings about their Reputation based on community reports and is based on feedback that’s been available since day one of the Xbox One’s release. But don’t worry – other players can’t just file fake reports out of spite to lower your Reputation level. Microsoft’s system can weed out false reports and isn’t made to punish you within a few weeks of playing. Those with Yellow Reputation levels will begin receiving warnings this month regarding the same. As for Red Reputation levels, you’ll see reduced match-makings and the revoking of certain features such as Twitch broadcasting if you fail to listen to warnings and just outright continue being a jerk. Microsoft has outlined its entire policy and enforcement here, so you can check it out to learn about the team that will be monitoring Reputations, the values they hope to instill and a Code of Conduct for players to follow. What are your thoughts on the Reputation system thus far and will it yield positive results? Let us know in the comments.